Part two of our #turnyourclosetaround series has arrived with Chris and Julia, the power duo behind the successful home décor, design and DIY projects blog, Chris Loves Julia. Since 2009 they've been sharing their beautiful home renovations, transformations and design ideas with the world - and now, it's time to tackle the closet! 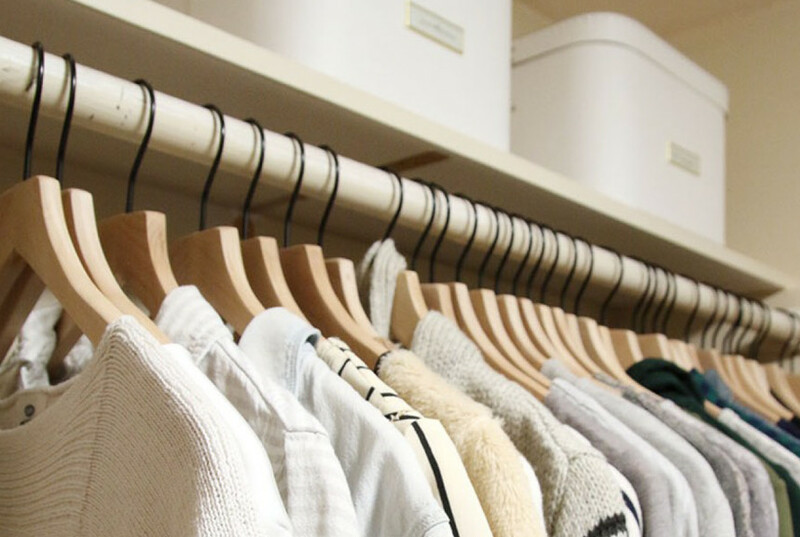 See how they turned their master closet around with some of our favorite closet products, below! 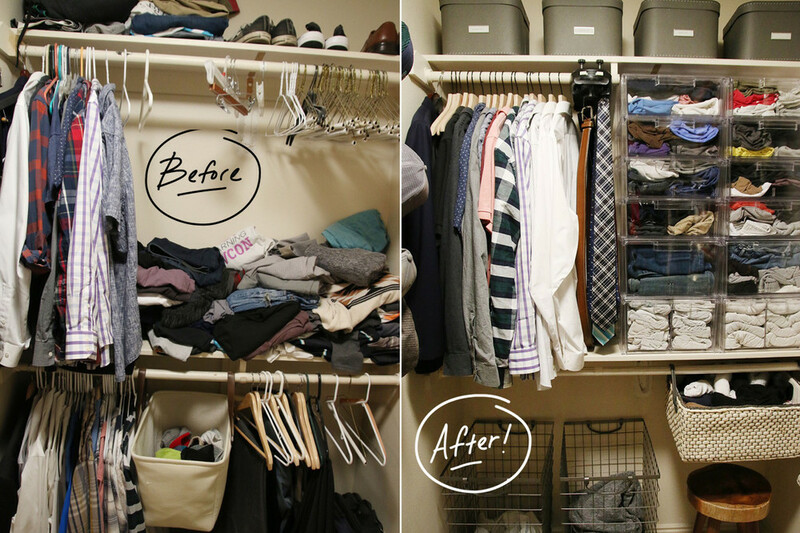 Before, Chris and Julia's closet had tons of storage potential, but lacked organized solutions to help divide and sort their shirts, shoes, hats and pants while still making them easy to find. On Chris' side he loved to fold but not to hang, so everything ended up crammed and stacked. On Julia's side, she's a self-admitted shover. She tended to put pants, shirts and shoes really anywhere she could find them - which left no free room to organize or find smaller accessories like belts and jewelry. 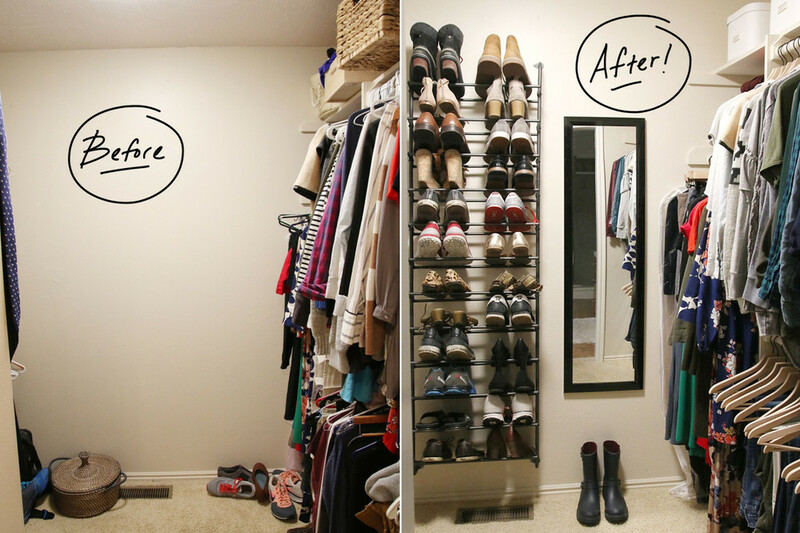 After, Chris and Julia transformed their master closet madness into a space where everything lives in its right place. Chris and Julia mounted our Gunmetal 36 Pair Over the Door Shoe Rack on Chris' side of the closet to store the both of their shoe collections. Now, all shoes are up off of the floor and an underutilized wall serves a worthy purpose! Basic Lotus Wood Hangers replaced all the mismatched hangers from before. Not only do they give a uniform look to the closet, but they keep even their heavier garments straight and organized no matter what. Julia used our Clear Shelf Dividers to transform the smaller shelf she had into three very useable sections. (on the far left). Beautiful Oskar Storage Boxes line the top shelves on both sides of the closet. Chris and Julia now use them to store out of season clothing, costumes and little accessories. The labels on the front make them easy to identify from afar and they make full use of that tricky top shelf! Chris used our Clear Stackable Sweater Drawers in the bulk of his free vertical space. He loves how they still give him the ability to stack instead of hang, but now with an easy-to-see organization of his things. No more stacking piles high and sifting through socks, shirts and pants just to find one piece of clothing. Our Lighted Motorized Tie Rack was also a big hit, and Chris now uses it to organize all of his ties as well as all of his belts. With a simple push of a button, he can rotate through all of his tie and belt options and, when finished, put the rack right back in its place. The PerfectCurve Cap Rack holds all of Chris' hats in a neat and orderly fashion. Now, he can see each hat at a glance and they're hung in a way that ensures their structure isn't compromised. The couple used two of our Harvest Hampers with Wheels to add a lovely and somewhat rustic look to the space. The wheels of the hampers make it easy to transport from closet to laundry room, and two built-in handles make them a breeze to lift. 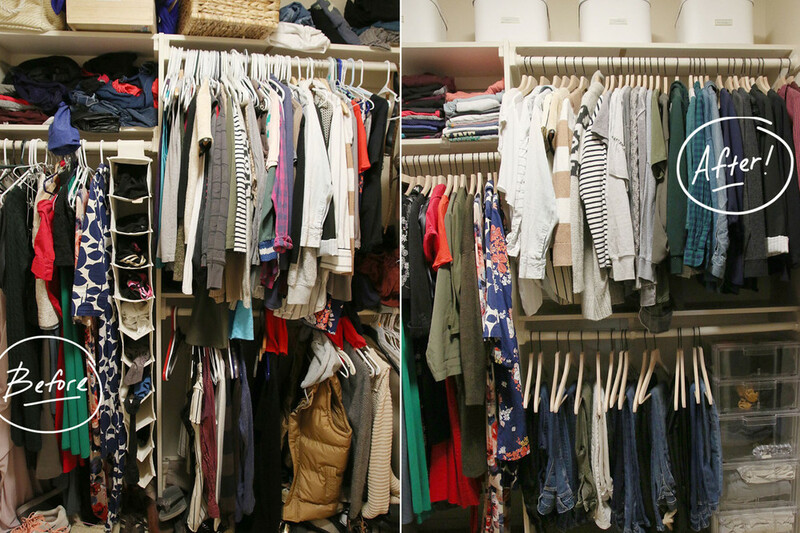 What do you think about Chris and Julia's complete closet makeover? Let us know in the comments and stay tuned for more #turnyourclosetaround makeovers!